At Best Stainless, we have the ability to perform single to production steel and alloy saw cutting. 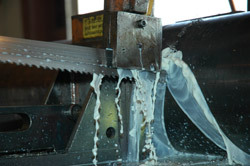 Our saws have capacity of cutting up to 26” diameter. We pride ourselves on running an efficient saw schedule to ensure that our lead times stay minimal and orders ship on time. Ask a sales representative for more details.